MONEYBALL: Miller's latest is set against a backdrop of wealth and privilege, but doesn't have much to say about either. "I hate Bennett Miller." "Everything I've ever said positive about the movie I take back. I hate it. i hate it. i hate it. i hate it. i hate it. i hate it. i hate it." No, those aren't the sentiments of a reviewer underwhelmed by Miller's bafflingly pointless new film. They're sentiments tweeted last month by one of the men it's about, Olympic wrestling champion Mark Schultz. "You crossed the line Miller," Schultz continued. "You're [sic] career is over." "You think I can't take you down coz ur a director. Watch me Bennett." Perhaps most significant was the tweet that sought to direct readers to the memoir Schultz published in November chronicling the events dramatized in Miller's film. "For the true story (not the one the movie is based on ... actually I don't know what story the movie is based on) read my book." In Foxcatcher, Channing Tatum plays decorated athlete Schultz — now 54 — as an inarticulate lug seething with undefined bitterness and given to wild mood swings. Anyone who reads Schultz's tweets and sees the film is likely to feel the actor captured something of his essence. Did I mention that Schultz raved about Foxcatcher after its Cannes premiere? And that he's an associate producer? I can't account for his change of heart. Members of the Hollywood press, however, have postulated that, after multiple viewings, Schultz suddenly realized that screenwriters E. Max Frye and Dan Futterman were hinting at a sexual undercurrent in the strange relationship between the wrestler and his sponsor, multimillionaire ornithologist, cokehead and diagnosed paranoid schizophrenic John du Pont. And he freaked. Perhaps you're picking up on the fact that this is a movie about disturbed dudes. That much is true. But almost everything else in Miller's latest is not. Events depicted in the film are either completely fictionalized to serve the director's theme or chronologically rearranged or compressed. The bottom line: Any given thing you see in the picture probably never happened. Steve Carell delivers a super-creepy performance as du Pont, with the assistance of a prosthetic beak so impressive it almost merits a costar credit. The film suggests that du Pont built a wrestling training facility in the 1980s ostensibly as an act of patriotism, but in reality as a means of dealing with monumental loneliness, insecurity and mommy issues. He invited Mark to live there and, later, his older brother, Dave, also a gold medalist. Mark Ruffalo portrays Dave as the sole voice of reason in an increasingly crowded madhouse. The movie takes 135 minutes to say absolutely nothing of consequence about America, entitlement, the power of privilege, the haves and have-nots, or what-have-you. It offers little more than the portrait of an unstable hobbyist behaving in unstable ways — a spoiled brat with a gun collection. The considerable talents of the cast make the film mildly interesting at times, but Miller never quite gets around to having a point. 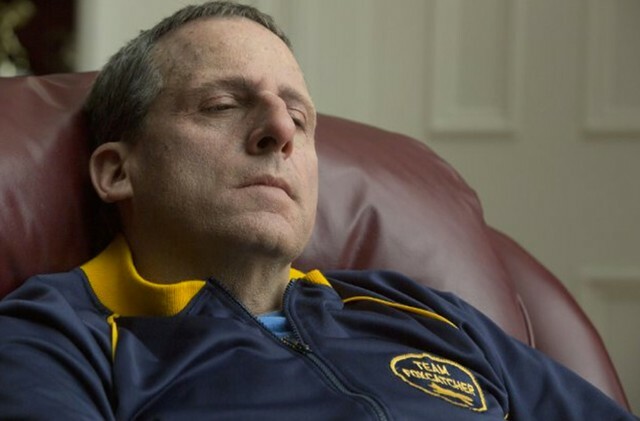 Watching Foxcatcher meander dourly into narrative dead ends and leave one storyline after another dangling, it's difficult to believe the same director gave us Moneyball and Capote. Something terrible occurs at the end of the film, but it's nothing the movie builds toward. The picture isn't in any sense about the tragedy and makes no effort to explain it. It comes out of nowhere, the random act of a deranged man. The filmmaker merely uses it as a punctuation mark, a futile grasp at gravitas calculated to move Foxcatcher up in weight class. Foxcatcher is not showing in any theaters in the area.